ArmInfo. 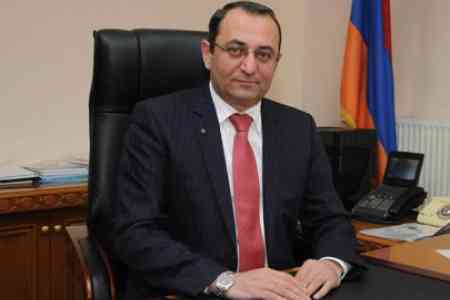 It is necessary to reconsider the Armenian government's approaches to management of state property, RA Minister of Economic Development and Investments Artsvik Minasyan stated at the RA National Assembly. In the second and final reading he presented the results of the 2017 program of privatization of state property facilities for 2017-2020. To note, the parliament of the country approved the submitted document at the meeting on September 11. According to Artsvik Minasyan, during the reported period 2.5 billion drams were received in the form of dividends from leasing facilities and their sale. Nevertheless, according to the minister, it is necessary to develop and offer investors packages of proposals that will be directed to the development of the country's economy. In total, two companies were privatized in 2017. In particular, 9.034% state stake in CJSC "Byuregh" and 100% state stake in OJSC "Mekhradzor geological base", separated from JSC "Geolog" were sold. As a result of privatization, 66.415 million drams were received, of which 4 million drams are transferred to the budgets of communities, and the remaining amount - to the state budget. In 2017, investment and social obligations were assigned to 10 buyers, of which five fulfilled the state-proposed terms for 203 million drams and $ 17 million. As part of social obligations, 2 buyers pledged to open 26 new jobs, and 4 buyers pledged to maintain a profile oriented organizations.